Interview: Ashlee Simpson and Evan Ross open up about making music together! 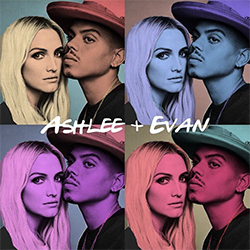 Ashlee Simpson and Evan Ross have been married since 2014 and earlier this year they released their first EP together. It marks a long-awaited return to music for Simpson, whose last album Bittersweet World was released in 2008, and it’s the first time fans have heard her singing with husband Evan, the son of the legendary Diana Ross. After teasing a number of tracks, Ashlee and Evan released their self-titled EP last month. The music coincided with the premiere of their new reality series Ashlee + Evan, a six-part series on E! Entertainment Television. It’s already aired in the US but it arrives in the UK on 13th January at 10pm on E! UK. I had a chat with Ashlee and Evan to find out why they decided to make music together, discuss finding their sound, and to talk about letting cameras into their lives for their new reality show. Hi guys. Where are you answering these questions from today and how are you doing? Ashlee: We are in London. We’re so happy to be out here. It’s adorable and we just got back from the MTV EMAs in Bilbao. Evan: We’re having so much fun out here! You’ve been releasing tracks from her forthcoming album and there’s a real mix of sounds and styles. What can fans expect when the album arrives? E: I think you’ll be able to see into our love and our relationship, and the music that we’ve been inspired by that inspired songs that we’ve created on this album. E: … and conversations of love. Why did you decide to make an album together. What challenges did you face bringing it to life? A: …and we would annoy our neighbours (laughs). E: Exactly. I think it was just one of those things that we really wanted to do with each other and we wanted to share with the world. Individually your musical styles are quite different but when you come together the results are quite magical. How did you find your sound as a couple and how much compromising did you have to do? A: I think our sound just kind of came about. I feel like it was something very natural. E: I think we just were having fun and in that process we would take from different inspirations and songs that we love and find different sounds. In that process we came up with the album. A: We didn’t want it to be just one sound. E: A lot of the songs started out just working on songs acoustically and really stripped down, and then it turned into what it was. The album coincides with your new reality series. Ashlee did you have any reservations about letting the cameras back into your life given that you’ve done a reality show before? A: Yeah I definitely didn’t think I was going to be doing reality TV again but I was happy to do this. It was something beautiful and Evan and I got to share our love. We were executive producers on it. E: We got to create it in the way we wanted to create it and make it as authentic and truthful as we really felt like it should be. It turned into something really special and beautiful. At first yes it was a little bit of a scary idea to do a reality show but at the same time it was nice to let people in and get to see who we really are. What kind of pressure does being followed around by cameras 24/7 have on your marriage? A: We didn’t have too crazy of a shooting schedule. We definitely had our alone time as well. E: It wasn’t too much. I feel like we had to find a way to make sure that the kids didn’t feel like it was too much and we didn’t make storylines around them. At the same time it was definitely a change in lifestyle having cameras around. A: It was definitely a bit more hectic in our house! E: We actually made friends with all the people that were working with us so after it was done we missed some of them. A: Yeah, they were sweet people. Are there any plans to tour in support of the album? E: We’re starting touring on January 7th and we’re going to do a bunch of shows. We’re excited! A: We’d love to come to Europe and tour too. E: Yes we would love to do that. Looking to the future have you been thinking about making music together or will you be focusing on solo projects? A: We have more music coming out together and we’re really looking forward to sharing that next part with you guys. Then we’re definitely going to do our own solo projects. E: … and maybe down the line we’ll do other songs together again. You both come from musical families. What kind of advice and support do you families give you when it comes to your music? A: Our families are so supportive. They’re definitely loving us and loving our music and they’re all proud of us. E: Yeah they’re so supportive. I think that’s one of the really lucky things that we have, is that our family has been supportive in this entire process. They’re excited that we were actually putting out music and that we’re going to be able to show everybody what we’ve been creating. What’s the one thing you’re hoping that people take away from the music you’re making together? A: It’s about love and I hope that people can enjoy some good duets. We’ve always loved good classic duets so it’s fun to be able to do that together. E: I think it’s a really important time to actually do something positive and talk about things that are positive and sharing ourselves with the world like that… a young couple that is also trying to figure things out and working through things, and juggling having a career and being parents and the whole thing. I hope that people just really enjoy the music and feel the love.